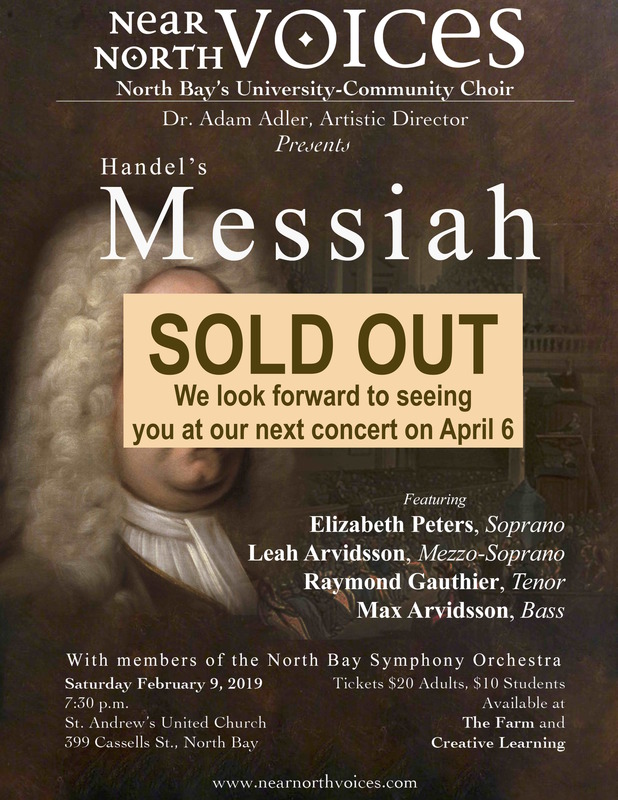 Dear NNV Fans and Audience Folks: Our Messiah concert has sold out, 3 weeks before the concert! This is unheard of for a classical music event in North Bay. As a result, we will not be selling tickets at the door. We may have a few (very few!) tickets come back on return from individuals who find they cannot attend, and we can put people on a waiting list for those. Our apologies to anyone who has missed out on this event. We look forward to welcoming you at our next concert, “Near North Voices: Up Close and Personal” on Saturday, April 6. 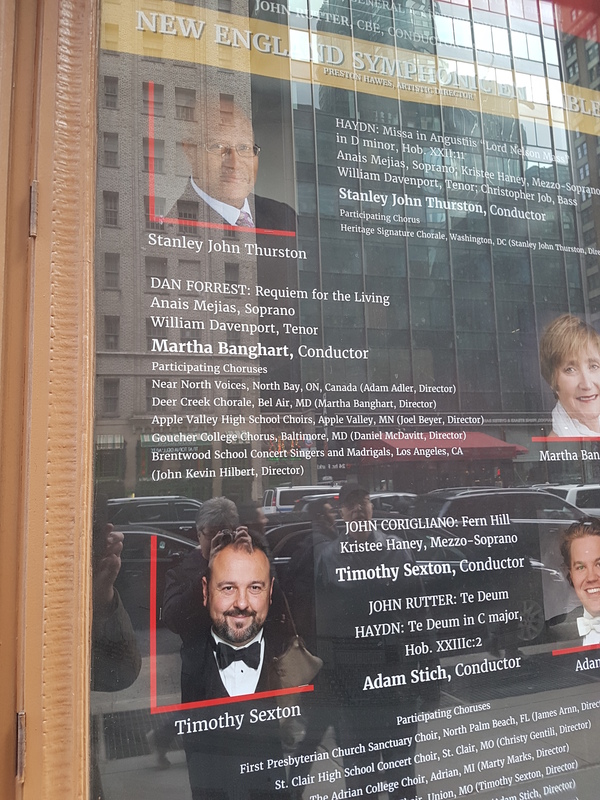 A contingent of singers from Near North Voices travelled to New York City to participate in the performance of Dan Forrest’s Requiem for the Living under conductor Martha Banghart at Carnegie Hall. 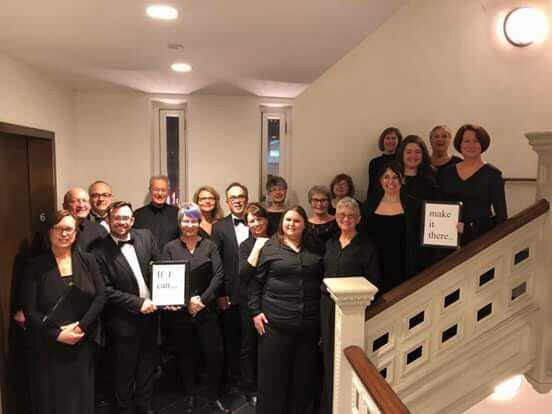 Near North Voices performed this work in a version for choir with organ and chamber orchestra in our last season, and we were invited by American conductor Martha Banghart to join with her choir and others for a performance of the work with a full professional orchestra at Carnegie Hall. Due to work and school commitments, approximately half of last seasons’ choristers were able to undertake the trip. 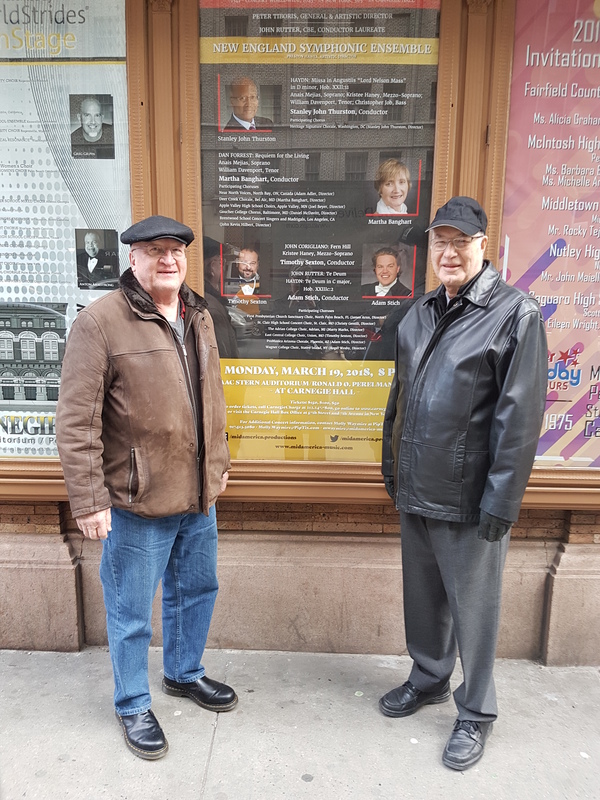 The singers participated in several days of rehearsals, and performed the concert with full orchestra under the lights of that famous concert hall on March 19. Near North Voices is thrilled to announce that one of our choristers, Jack Weston, has recently been accepted to the 3-year college diploma program at the Randolph Academy for the Performing Arts in Toronto. Jack will commence his studies in January, 2018. We are grateful for the significant contribution that Jack made to NNV during his several years with us, and we wish him the best of success in this next stage of his journey. 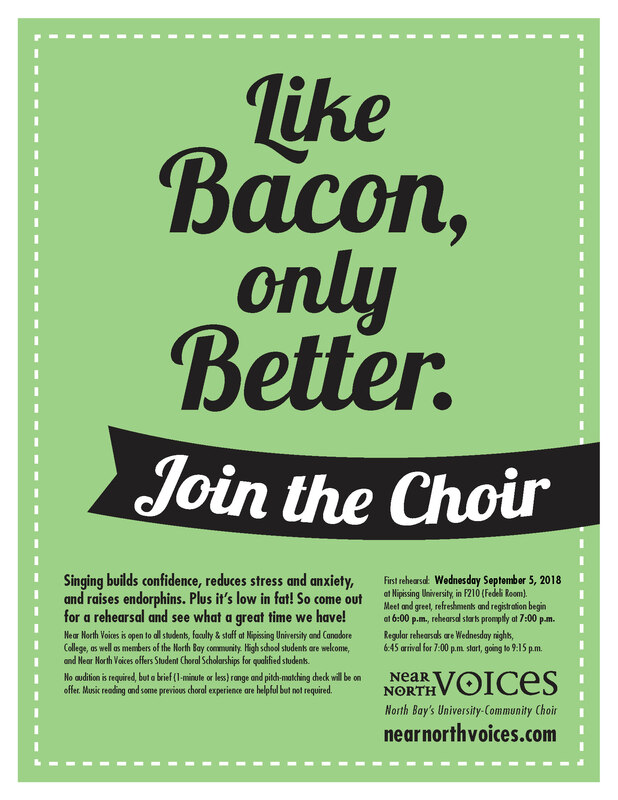 Near North Voices’ begins our 11th season on Wednesday, September 6, 2017!! Near North Voices’ 11th season will begin on Wednesday September 6, 2017 in Room F210 off the front lobby of Nipissing University. Meet-and-greet and refreshments, orientation, range and pitching checks for new members begin at 6:00 p.m., and our rehearsal begins at 7:00. Bring a pencil and a sense of humour. 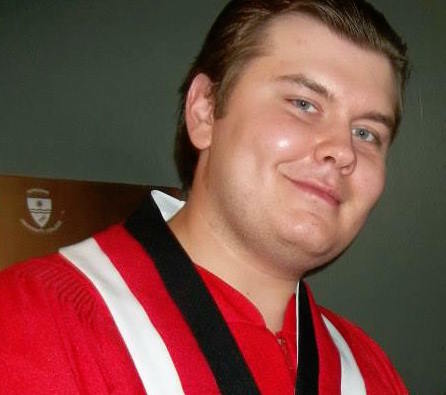 Membership in Near North Voices is open to students, staff and faculty at Nipissing University and Canadore College, as well as to members of the North Bay and area community. Choral Scholarships are available for qualified high school students. For more information, see our About Us, Listen to NNV, and Contact Us pages. A reminder about parking: Paid/permit parking on campus is now enforced until 11:00 p.m. Community members and anyone who doesn’t hold a permit will have to park in the central visitors’ lot and pay at the machine.